Concealed Carry Holsters: Important concepts in finding the right holster for you! When it comes to equipment issues, I feel comfortable in saying that there is no area where my students struggle more than in selecting the right concealed carry holster. It really isn’t surprising. Think of the choices. The types of holsters, the materials they are made of, the positions they can be carried in. It adds up to a lot of choices. More than your gun shop is going to carry, more than you want to sort through and more than any one person can be expected to get right on the first time out. The problem is that when it comes to concealed carry holsters, getting it wrong can have some serious consequences ranging from discomfort to safety issues. This means that there are some things you need to get right the first time. So, today and in fact for the next few episodes, we are going to talk holsters! In my trailer, I have a bin full of holsters that students often need to dip into to solve holster problems in class. The problem is that solving students holster problems in class takes time, I often don’t have the perfect solution, and worst of all, when it is class time, I fell like a solution is already late to the game. The student has already spent their money on a holster. Wouldn’t it be better if we could sort out some of these issues before we make a holster mistake? Or maybe before we make another holster mistake??? It all starts with working to understand the duties that a quality concealed carry holster has! A concealed carry holster has a complex job. Often times the different duties of the concealed carry holster are counter to each other. This makes a holster difficult to design and difficult to select. This can be one of the most difficult and at times frustrating aspects of concealed carry. If we work to understand concealed carry from a conceptual concept it can help us to break down the complexity and make some good choices. You should expect your concealed carry holster to carry your concealed carry handgun safely, comfortably and securely while allowing you quick access to your handgun should you need to defend yourself or your loved ones in a life threatening violent encounter. When it comes to carrying a concealed handgun, the reason you decide to carry a gun is safety. That gun is a tool that you can count on to protect yourself and others should you face a lethal threat. If you don’t keep safety at the forefront of your consideration you risk the handgun that you selected to carry for safety becoming the implement of harm to yourself and/or those that you love. Your actions should always be your primary safety consideration. How you interact with the firearm. 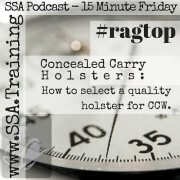 Understand however that selecting a holster is an issue of safety. The wrong holster can be downright dangerous. Carrying a handgun concealed can be an uncomfortable task and the unfortunate reality is that comfort can be a major roadblock to you carrying a handgun. No one wants to be uncomfortable and even the most safety conscious individuals will eventually find themselves leaving the gun at home if they can’t find a comfortable way to carry their handgun. You don’t have to make a choice. Proper holster (and handgun) selection can have a tremendous impact on your ability to carry your handgun comfortably. A handgun that is comfortable to carry is a handgun that you will be much more likely to carry! Your concealed carry handgun needs to be secure. I’m not saying that you should have a combination lock on your holster. I will advise however, that when you put your handgun into your holster it should stay there until you take it out. Your handgun shouldn’t fall out of the holster even if you and your holster get turned upside down. None of us really plan on being upside down, however, you might find out that you are in a life threatening confrontation for your life when your are struck from behind and end up going head over heels. In that situation, you need your handgun right where you put it when you woke up that morning. Anywhere else simply won’t due. The same premise applies if you find yourself in a rollover accident or a fall on the ice. The last thing you want to have to concern yourself with is the question, “Where is my gun?” At these times you have more important concerns. You want to select a holster that keeps your gun where it belongs. Too much of a good thing can be a reality with concealed carry holsters. I just finished telling you that you need to make sure that your gun stays in the holster. That is, except when you want the gun in your hand. Then it needs to come out easily. Seems a bit counter to security doesn’t it. Too much retention in your holster can lead to your gun becoming inaccessible. Not being able to get your gun could be just as dangerous as your loaded gun being out of your control. You must find balance. We have already discussed the duties of your concealed carry holster. It isn’t enough to know what your holster should do, you also need to understand how to evaluate if your holster will actually meet the demands we have set forth. The performance of your concealed carry holster largely depends on the characteristics of the particular holster you are evaluating. Let’s take a look at the characteristics of a quality concealed carry holster. Often time’s people forget that success with concealed carry requires you to view concealed carry as a system. You don’t want to be the individual that focuses only on one aspect of concealed carry. For example, many folks many people tend to have hyper focus on the gun to the exclusion of all else. They select the best handgun that they could possible ever consider for defensive use without considering important factors that may influence THEIR ability to carry the gun efficiently. You can make this same mistake when selecting a concealed carry holster. Your holster needs to work with your entire concealed carry system. 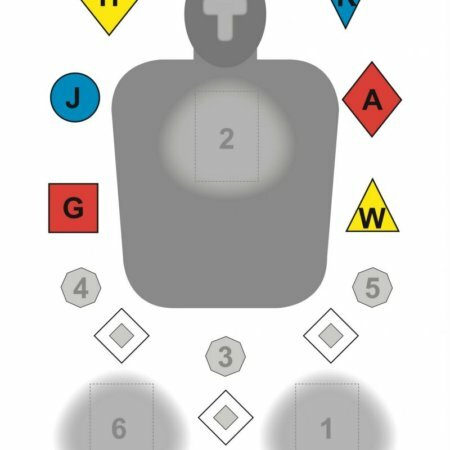 The carry position you intend to use. The holster needs to be set up to carry in the specific position on your waist line that you intend to carry it. What clothing will you use to conceal the gun? If you intend to wear a coat with a tucked in shirt, the type of holster will, in part, determine how successful you are. Does your belt offer the kind of support that the holster and gun require? Even small guns are heavy. Thick stiff belts help to spread that weight out on the waistline. The size of your belt. The belt loops on the holster need to specifically match the size of your belt. No one part of the concealed carry system can operate independently. Each depends on the rest for the overall success of carrying a concealed handgun and success in carrying is important. The more your whole system works together, the more likely you are to carry your defensive handgun. That is a good thing, because, the more often you carry a gun, the more likely you are to have that gun should you need it to defend your life. When you select a concealed carry holster it is important that you select one specifically for your concealed carry handgun. It is important to know that when you select a holster and it fits 76 different handguns it probably wasn’t designed for your specific handgun. You may have heard the phrase, “Jack of all trades, master of none.” That is a great way to describe many of the generic holsters that are out there. These are holsters that will work marginally well with a bunch of different handguns but they are less than stellar with most handguns. They don’t fit well, they don’t retain well, they are sloppy on your belt and often difficult to re-holster with. So, you might ask yourself, why are there so many holsters that are one size fits many? Well, there are a lot of guns out there that are suitable for concealed carry and it is a big challenge to build and stock holsters for all of those guns. When you consider the stock that would need to be carried by your average gun-store to have the holster that was right for you and every other customer that walks in the door it would number in the hundreds. That is a complicated and hefty investment. As a result, most shops opt for the “one size fits many” approach. The end result is you may need to make a special order or an on-line purchase to find the holster that is right for you. When you make that purchase, one of the important things you will be looking for is a holster that is designed specifically for your gun. If you have an understanding of firearm safety then the idea that it is the trigger of the gun that activates the gun and allows it to fire. Of course, we do not want a firearm to fire unless you intend to fire it. This means that the entire trigger guard area of the gun needs to be covered. If the trigger guard area is completely covered it will be very difficult for the gun to fire unless you intend to fire it. With your trigger area completely covered it could be very difficult for some kind of a foreign object to enter the trigger guard and inadvertently fire the gun. With the trigger area completely covered it is very difficult to have your finger enter the trigger guard and inadvertently fire the gun. When your defensive handgun fires it should always be an intentional act, an act where you considered the totality of the circumstances of the situation and made the conscious decision to fire the gun. One of the most important jobs of a concealed carry holster is to make sure the gun does not fire without that deliberate intent. One of the most important ways it can do that is to completely cover both sides of the trigger guard area of your handgun. You defensive handgun needs to stay in your holster until you decide to draw it out and it is the job of retention to make that happen. Making sure that your handgun remains in the holster is critical for safety for two important reasons. A gun that comes out of the holster unexpectedly is not under your control and could end up in the hands of an unauthorized user. A gun that comes out of the holster unexpectedly may not be in the holster when you need it to defend yourself. Proper retention keeps your firearm inaccessible to unauthorized users. One of the best places to keep your handgun secure is on your body. A handgun that is secured in your holster cannot easily access your concealed handgun unless they interact with you. It doesn’t matter if that person is motivated by malice or curiosity, to access a handgun properly retained in a holster requires some kind of interaction with the person that should be in control of that handgun, you! When we are going about our daily activities carrying our defensive handgun, it is certainly reasonable that we may find ourselves in a physically compromised situation. Imagine slipping on some ice or tripping on an uneven piece of pavement. Ending up on the ground is bad enough, but having your gun come out of the holster and fly across the pavement makes it worse. Who knows who might end up in control of your gun. Certainly someone that is bigger or stronger than you or someone that has a weapon may be able to compel you to surrender your handgun no matter how good the retention is. Concealment, however, is an important security measure when it comes to concealed carry. As the name implies, concealment ensures that your handgun is unseen. Retention keeps your handgun in the holster until you decide it is time to draw it. Proper retention keeps your handgun accessible to you when you need it. When we consider the situations above where we described how your concealed carry handgun might come out of the holster we have to understand that losing control of our defensive handgun has consequences that cut both ways. Yes, it could fall into the wrong hands. We also have to accept that it may simply not be in our control when we need it. If your holster doesn’t retain a handgun properly, who knows when it may come out of your holster? If it departs your control prior to the circumstances you need your gun, you will face the consequences of not being armed when you think that you are. The consequences are different but may be no less tragic. Proper retention helps you to make sure that you avoid either circumstance. Make sure to select a holster with the proper retention. Good question. Typically concealed carry holsters use friction for proper retention. On holsters that are made out of hard materials like polymers, retention is typically achieved with a ridge or bump that the most forward part of the trigger guard must pass to holster and un-holster the gun. Often times tension on the this type of holster can be increased or decreased as needed through the use of a tension screw adjustment. Holsters made from soft materials like leather or nylons may depend on friction across the whole holster to secure the gun. Keep in mind how you wear the holster and how the holster is attached to the belt can have a significant effect on retention. The retention of the holster alone is irrelevant. What really matters is how retention is when the holster is part of the system. Although retention is important, there can be too much of a good thing. It does you no good to carry a concealed carry handgun if you can’t get it out of the holster. Your concealed carry holster needs to help make your gun accessible to you when you need it. This requires a balance between accessibility and retention. Too much retention and the gun is just an accessory, too little retention and the gun may not be there when you need it. So make sure the level of retention is appropriate. However, accessibility is more than just retention. Let’s take a look at some of the important characteristics that can affect the speed with which you can draw your gun. Depending on your build, flexibility, athleticism, what you spend your time doing and other factors, your carry position can have a drastic effect on how quickly you can access your handgun. For Example: Someone that spends the majority of their time sitting in a vehicle may find that carrying behind the hip puts the gun in a position that the seat interferes with the draw and slows your access to the handgun. On the other hand, if an individual has extra girth in the midsection, they may have a difficult time carrying in the appendix position. It isn’t likely that a button up shirt that is open in the front will get in the way when you need to draw your handgun. In general, the more layers and the deeper the concealment and as a result, your draw will be slower. On the other side of the coin, the fewer the layers and the lighter the concealment, the quicker the draw. Often times our environment has as much to say about our concealment garments as we do. Understand, it is a factor. When carrying a concealed handgun the height that the gun is carried at can affect your draw speed. A gun that is carried high on the belt line can lead to an awkward hand position on the gun while a gun that is carried low in the waistband can make acquiring the grip more difficult. As with many of the issues that we are looking at, it is often a matter of finding the balance that works for you. If you can fine tune your carry position, concealment garments and the ride height of your holster in your waist band you can move a long ways toward improving your concealed carry holster and your ability to carry concealed in general. When it comes to self-defense with a handgun, re-holstering isn’t the biggest deal out there. It is much more important to be able to get the gun out of the holster than to get the gun back in. I do, however, want it to be relatively easy to re-holster my handgun. Imagine this. You were just forced to defend your life from a violent attacker. You drew your handgun and dealt with the threat in the way that the circumstances dictated. The incident appears to be over. You assess the area and the situation and you appear to be safe. So you begin to re-holster the gun. Right now, when your adrenaline is maxed out, you are terrified, experiencing a loss of fine motor control and your mind is moving in a thousand different directions, is this when you want to be struggling to get your pistol back into the holster safely? What about out on the range? You are training with your favorite instructor. Rep after rep. Working the fine points or maybe focusing on the decision making that is so important in defensive shooting. If you are pushing hard how much of your energy so you want to invest in re-holstering your handgun? You certainly don’t want to be reckless, but if you can select a holster that allows for an easy and safe re-holstering process, why wouldn’t you want that holster? As long as there aren’t other reasons the holster isn’t a good selection, you should opt for the holster that makes it relatively easy to put your gun away. The single characteristic that makes it easy to put your gun away is a holster that has a top that stays open at the top. If the holster stays open on its own, it is much easier to find the holster, and insert the gun. Look for holsters that are made out of stiff materials like plastics and polymers. Leather or nylon holsters often incorporate a layer of metal or plastic sandwiched between layers of the holster material. I want my concealed carry holster to stay put! When I put it on my body in the morning I put it where I want it which is the same place it is at the end of the day. This helps to make sure that my handgun is in the same place all day long. There are simply too many aspects of a violent encounter that you and I can’t control. Why should you leave your handgun’s location on the body up in the air? If you twist left, your holster and your handgun need to twist left as well. If you zig, the last thing you want your holster and handgun to do is zag. Your holster needs to stay in the same place on your waistline and in the same position relative to the rest of your body. Our body is constantly sending information to the brain about its location. It is called proprioception and it is why you always know where your body’s pieces parts are. Since you always know where your bodies pieces parts are, if the holster and gun are always in the same place you always know where they are as well. The primary way to secure your holster in place is to make sure that your belt and holster belt loops are matching in size and that the loops are securely attached to the body of the holster. Solid belt loops that grab onto a stiff and sturdy belt are likely to stay where you put them. A quality holster stays put and makes sure you always know the location of your holster and concealed handgun. That holster of yours is a very important part of the concealed carry system. The slimmest single stack 9mm looks like Beretta 92 when it is carried in a holster that drops the concealment ball. 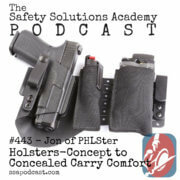 The holster is designed with concealment in mind. Remember that it is a concealment holster that means that the holster that you use for concealed carry needs to be concealable. Before we can make good choices we need to make sure that we are educated about whatever it is that we need to make decisions about. When it comes to holsters, the education in the gun world seems to truncate at the idea of a holster as a “gun holder.” Hopefully you have seen that a holster is much more than that and now understand that the holster has a complex and challenging set of duties to execute in order to help you carry your concealed carry handgun comfortably, safely, securely and still provide you access to that holster when you need it most. https://safetysolutionsacademy.com/wp-content/uploads/2017/02/New-Color-SSA-red-Oval-blue-wText-1030x417.png 0 0 ssa https://safetysolutionsacademy.com/wp-content/uploads/2017/02/New-Color-SSA-red-Oval-blue-wText-1030x417.png ssa2015-02-26 17:06:022015-02-26 17:06:02Concealed Carry Holsters: Important concepts in finding the right holster for you! When we purchase our own handgun, we should understand that it’s not just about the gun itself, but of course, you also have to consider purchasing a holster. But not just a holster, should be a perfect concealed carry holster, that is comfortable to wear and does its job perfectly. Thanks for sharing! Great article!